A major part of modern Instrumental Analytical Chemistry, focuses on the study of the energy exchange between electromagnetic radiation and matter. These interactions are visible to the naked eye, when the radiations concerned fall within the visible spectrum. Electromagnetic radiation is represented in two ways, i.e. as an electromagnetic wave (undulating), and as a series of discrete energy packets – the photons – (three-dimensionally). In terms of its wave properties, electromagnetic radiation is a form of energy that propagates even in a vacuum: it is the simultaneous propagation in space of orthogonal oscillations of a magnetic and electric field. Frequency→ ν → is the number of vibrations per unit time. It is measured in Hertz (Hz). Period → T → is the time needed to perform a complete oscillation. It is the reciprocal of the frequency and is measured in seconds. Wavelength→ λ → is the distance between two points of the same phase. It is measured in Å. Several types of electromagnetic radiation exist, which differ in wavelength and, consequently, frequency and energy. Although electromagnetic waves account for a number of different phenomena, their nature remains unchanged: what changes is the energy of the wave, and therefore its wavelength. 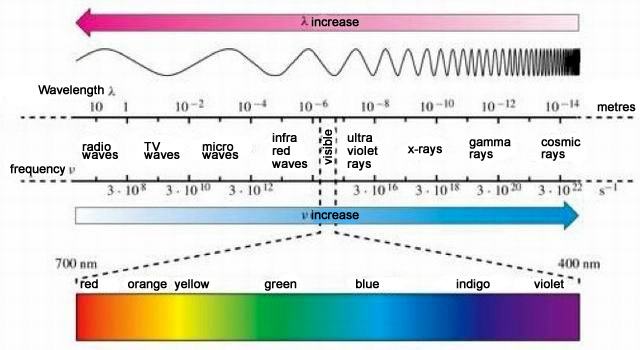 Low-energy electromagnetic waves have a high wavelength, so they don’t interact with living organisms (radio waves). Electromagnetic waves with higher energy levels, and consequently lower wavelength, can interact with animal and vegetable tissue, even molecules and atoms (x-rays, gamma rays, etc.). when a ray of light goes from one medium to another it is deviated (refrected), the degree of deviation depending on the wavelength of the incident ray. 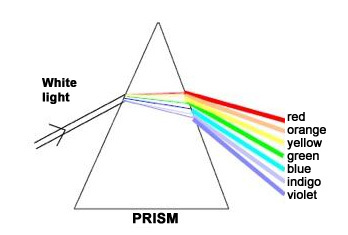 A single colour radiation obtained through dispersion, characterised by a specific wavelength is called monochromatic. Spectrochemical methods of analysis are based on analysis of the spectrum of substances, which can be an emission or absorption spectrum. an absorption spectrum is obtained when a beam of light is analysed after it has passed through a substance. 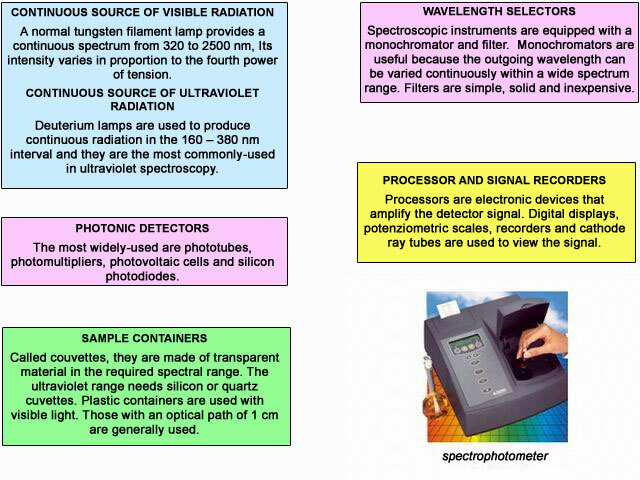 For the same substance, the emission and absorption spectra could be roughly compared to the positive and negative of a photograph: a radiation found in the emission spectrum will be absent in the absorption spectrum. Each molecular analyte can absorb specific electromagnetic radiation wavelengths. In this process, the energy of the radiation is temporarily shifted to the molecule and the intensity of the radiation decreases accordingly. by measuring the intensity of the emitted or absorbed radiations, it is possible to trace the amount of substance analysed. In energy fields (electric or electromagnetic heaters), atoms or molecules can absorb specific amounts of energy and move up to higher energy states. This phenomenon is called absorption. 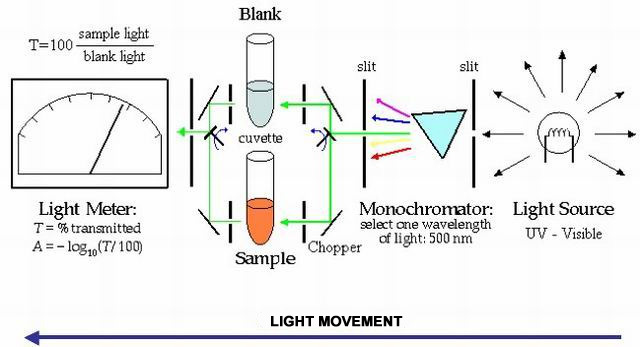 Qualitative analysis is performed using polychromatic beams, which are broken up into their various components (monochromatic radiations) by means of monochromators. One by one, the single monochromatic radiations of the beam are passed through the substance under examination, which will absorb the different radiations with differing intensities. The values recorded, reported on a wavelength-absorption diagram, produce the absorption spectrum of the substance examined. I: intensity of the luminous flux at the exit of the cell containing the sample. A = absorbance (it has no measurement unit). ε= molar absorption coefficient, typical of the substance (mol-1 L cm-1). b = optical path (cm), that is the thickness of the solution. 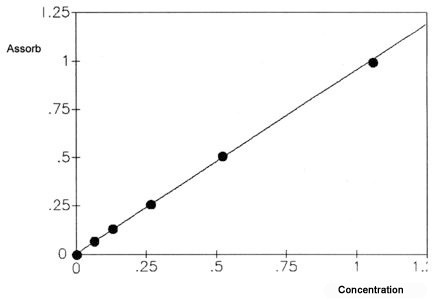 The proportional relationship between absorbance and concentration makes it possible to perform quantitative analysis. The equation A = ε x b x C represents a straight line passing through the origin of the axes and where ε x b is the angle coefficient. 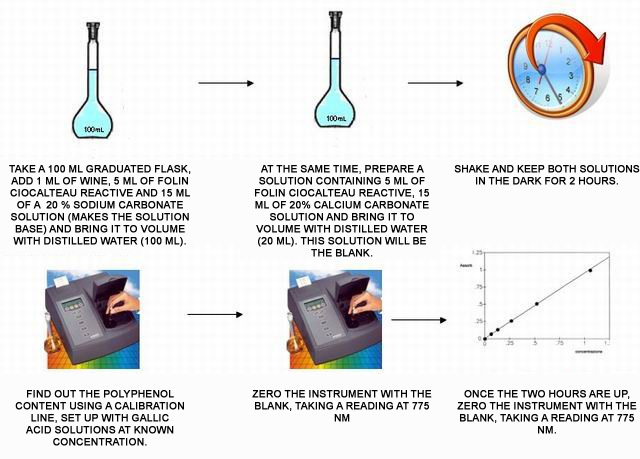 Reading of the sample at wavelengths typical of the analyte (polyphenols, for example, absorb at wavelengths of 775 nm); alternatively, scan the sample containing the analyte over a fairly broad interval of wavelengths, to obtain the typical absorption spectrum. Preparation of diluted standard solutions of the analyte to be quantified, and construction of the calibration curve indicating concentration on the x axis and absorbance on the y axis. The latter is read at the wavelength corresponding to the maximum absorption of the analyte. Total polyphenol content is considered a crucial piece of information in the quality control of musts and wines. Wines contain several types of phenol compounds. To assess their content, the ideal procedure would be to dose each one separately – which is not always possible, despite the sophisticated techniques available, since the results are not always replicable and are difficult to interpret. Therefore, an overall assessment of the polyphenol content is performed, using its reducing and UV absorbing properties. To quantify the content, a specific reagent is used called Folin-Ciocalteau reagent, which is a mixture of phosphotungstic acid (H3PW12O40) and phosphomolybdic acid (H3PMo12O40). In a base environment, and in the presence of polyphenols, the two acids produce blue-coloured tungsten and molybdenum oxides (W8O23 e Mo8O23), whose maximum absorption is of about 775 nm. The intensity of the colour is proportional to the concentration of reagent reduced by the polyphenols, which oxidise instead.